The Bow Corpse premieres Monday June 1st at USF Røkeriet, Nattjazz, Norway. Performed by BIT20 Ensemble, Nuria Guiu Sagarra, Thomas T. Dahl, Craig Farr, GMM and thousands of digital ghost clones. The piece is a one hour dystopian concert work for cello, violin, viola, flute, clarinet, harp, trombone, percussion, drums, electric guitar, computers, real-time swarm simulators and dancer. It touches upon how social media, privacy and big data challenges us as individuals and groups. It uses tiny micro-fragments of sound, scaled to massive cloud formations operating intelligent in flocks. Every musician in the orchestra is connected to their own real-time responsive swarm-simulator running a digital ghost clone of themselves. 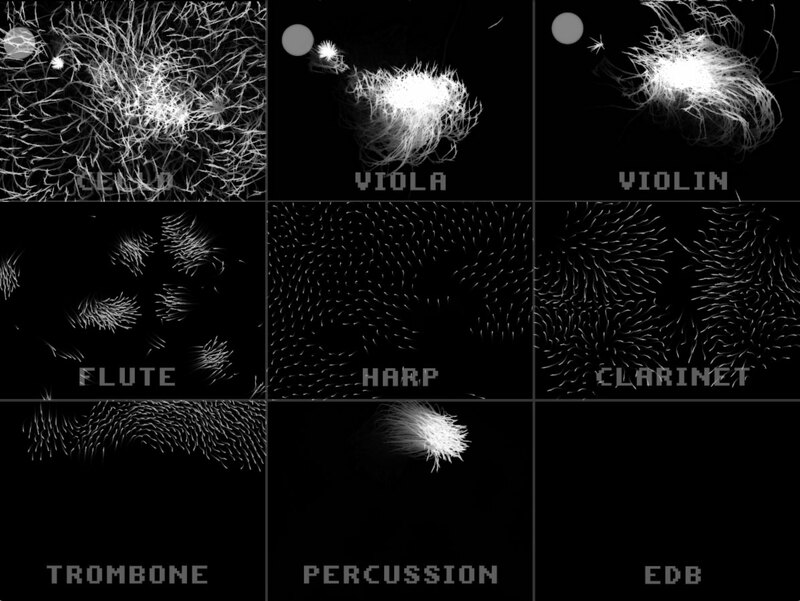 These musical ghost clones are built from thousands of microscopic sounds from each musician. The creation process has been documented with 2 minute video reports of the custom developed software we’re using, report from a workshop with the orchestra, and a presentation of the concept, methods and performance techniques. There is also an in-depth interview how the musicians are being cloned and a talk with the BIT20 Ensemble about the compositional process. You can also learn more through the Bow Corpse tag on this website. Performed by BIT20 Ensemble, conductor Baldur Bronnimann. Electric guitar by Thomas T. Dahl. Drums by Craig Farr. Dance by Nuria Guiu Sagarra. Computers by GMM. Composed by GMM and Craig Farr. Produced by BIT20 Ensemble and Uncanny Planet. Programming by Joao Fonseca. Arranged by Craig Farr. Choreography by Nuria Guiu Sagarra. Sound engineering by Thorolf Thuestad. Funded by Kulturrådet and Det Norske Komponistfond. Supported by BEK.